- Solar Alert now works through a comfortable and affordable annual subscription which assures the maximum quality in providing the dynamic information of the Sun, forecast that is updated every hour, each day, immediately to prevent in the most effective way the extreme solar events, in addition all users have 1 trial month to discover the superior quality of this new version 3.0. - Improved the algorithm which calculates the forecast and the recommendations against the consequences of hazardous solar events, with the news that it is now possible to have the solar forecast according to your geographical position anywhere in the world. - Implemented a new set of features to know in a visual way the exact time of arrival and the intensity of the solar events, from harmless and beautiful auroras to the dangerous extreme solar storms, including also the valuable geolocated forecast, applying the corresponding hourly correction according to your geographical position. - Implemented a new set of features to dispose the most important solar technical and scientific data with indicators of minimum and maximum value as well as the corresponding graphics dynamically updated from NASA and NOAA Solar data sources. On the future versions we will implement new technical data provided by the new satellites sent into space and new solar data sources. - Implemented functionality to provide images in realtime of the international space station, which receives the effects of solar events earlier and more intensely than in The Earth. - Implemented functionality to dispose detailed information of the State of the electrical networks of EEUU, very useful information to know in detail the effects of an extreme solar event. On the future versions will expand this information and more countries will be added. - We have improved the display of the valuable images of auroras and the Sun and we have implemented functions to save the images comfortably in your device Apple IOS. - Solar Alert is now able to show the exact day of the forecast in the main view, data sources have been expanded, the code has been optimized and the overall functioning of the application has been enhanced to provide the best service of protection and early warning for end-users against extreme solar events, potentially catastrophic events that scientists around the world have been advised that they can reach the Earth the next years, destroying all electric or electronic appliance connected to the power mains or without adequate electrostatic protection, and therefore leaving paralyzed by months or years all of our technological society. and all the machinery at your workplace. In a brief, simple, clear fashion, free of technical jargon, Solar Alert warns you of possible obstacles presented, in whole or in part, to our technological society, and which the scientists of NASA have already warned will happen in the next few years. • Take necessary precautions to reduce risks associated with defects in the functioning of telecommunications. • Avoid air travel if the App advises you to do so, since there is a high risk of general failure in aerial control systems and propulsion of aircraft in flight. • Disconnect your electric appliances in time to protect them from devastating power surges. • Take necessary precautions to protect your iPhone and your other electronics from intense magnetic fields. • Reschedule your car trips since, on the day of the arrival of the solar storm, transportation systems may be seriously affected and stop working. • Avoid severe obstacles posed by the failure of electromechanical systems such as trains and elevators in buildings where assistance to free you can take days to arrive. • Be alert and prepared for possible earthquakes caused by the intense solar activity, since there is a statistically demonstrated relationship between the two phenomena. • Be alert and prepared for serious safety errors in nuclear installations, since the cooling systems of nuclear reactors can be destroyed and rendered completely inoperative, logistics networks can become unused indefinitely, and this can pose very serious risks to people living within a radius of 200 kilometers around the nuclear centers affected. 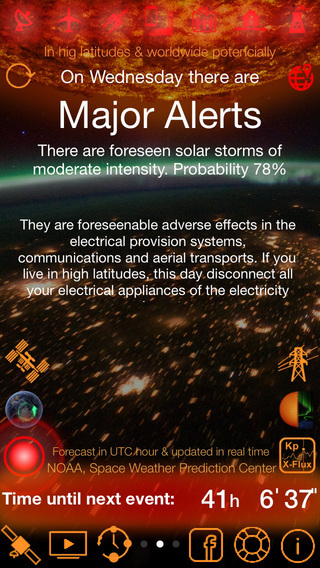 If you like Solar Alert, please rate and write a review for us in the App Store. It will take only one minute. Thanks! • Algorithm that analyzes the numeric indexes provided by the NOAA space agency, calculates alerts and recommendations, and displays this information in brief in language easily understood by all users. • Quick and easy visualization of solar alerts which provides you with predictions up to three days in advance at a glance. • Early alert system based on precautions and actions to take depending on the level of alert indicated by the App. • Visual timer that provides a countdown of time remaining until the arrival of the next solar storm. • Easy and comfortable access to graphics and images of the Sun, supplied by the observatories in space agencies NASA and ESA, NOAA and other duly indicated. • Easy and convenient access to the 30 best high-definition images of the sun provided by the observatories of the space agencies NASA and ESA. 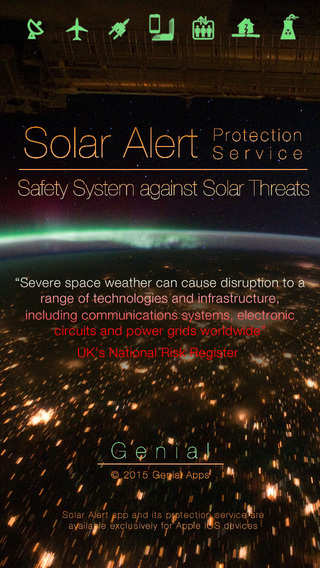 • Offline access menu with the list of preparations and precautions to take before the arrival of a severe solar storm. Information based on the recommendations of the agencies FEMA, ICDO, and NASA. With Solar Alert, now you can be warned up to three days in advance of solar storms that can paralyze our entire technological society. Solar alert App now works like protection service through auto-renewable subscription for only $2.9, this subscription that supplys the protection service in safe and preventive manner without user intervention, automatically renews at the end of each annual period of subscription. The subscription may be managed by the user and auto-renewal may be turned off by going to the user's Account Settings after purchase. Other apps by Genial Apps S.C.